This is the perfect product for a shining and strong look that lasts a whole day. Create the perfect sleek finished look with this styling essential! A reworkable wax that gives definition, shine and flexible hold that will last throughout the whole day. It can be washed out easily due to the water-based formula. The ingredients Silk Protein and Argan Oil stimulate optimal moisture retention within the hair cell. They repair and protect damaged, dry and weak hair from environmental extremes. 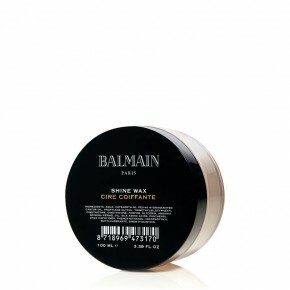 Invigorated with the signature Balmain fragrance, this Shine Wax is a musthave for both fashionable men and women! Use: Apply a small amount of the Shine Wax on your fingertips. Then style your hair. Tip: To create a sleek look, comb your freshly washed hair. Then apply the Shine Wax and comb back until the right style is accomplished.